101 Beacon is located on the south side of Beacon, between Arlington and Berkeley, with 1 Arlington to the east and 103 Beacon to the west. 101 Beacon was built ca. 1862, one of six contiguous houses (101-103-105-107-109-111 Beacon) built at about the same time and in the same style. 101 Beacon was built for Arthur Lithgow Devens. He was a lawyer and businessman, a partner in J. W. Paige & Company, dealers in domestic goods, and (from 1862) treasurer of the Appleton and Hamilton Manufacturing Companies in Lowell. 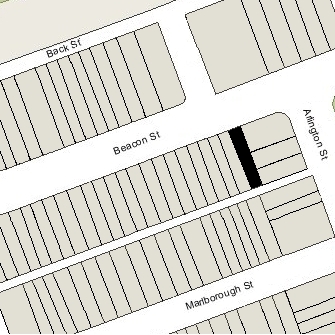 He and his wife, Agnes Russell (Elwood) Devens, lived at 3 Chestnut and do not appear to have lived at 101 Beacon. Arthur Devens purchased the land for 101 Beacon on November 22, 1861, from William Warren Goddard and T. Bigelow Lawrence. It was part of a tract of land they had purchased from the Commonwealth of Massachusetts on August 1, 1857, which included all of the land on the south side of Beacon Street from Arlington to Berkeley. Click here for an index to the deeds for 101 Beacon. On October 26, 1863, 101 Beacon was purchased from Arthur Devens by Elizabeth Boardman (Crowninshield) Mountford, the wife of retired clergyman William Mountford. They previously had lived at 158 Beacon. In 1871, the Mountfords were living elsewhere and 101 Beacon was the home of banker and broker Joseph Washington Clark and his wife, Eleanor Arnold (Jackson) Clark. They also maintained a home in Dedham. 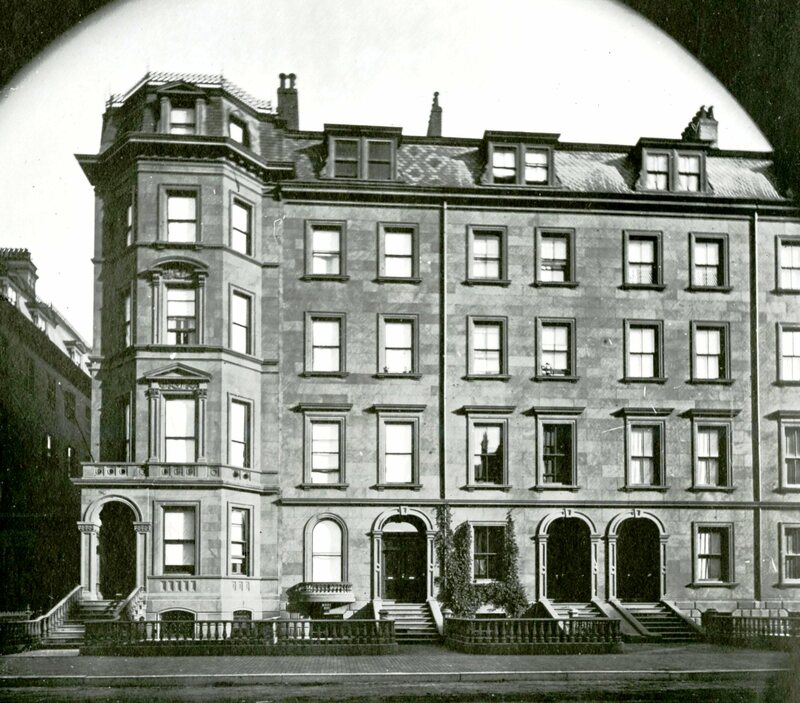 They continued to live at 101 Beacon in 1872, but by 1873, had moved to 8 Newbury. By 1874, the Mountfords had resumed living at 101 Beacon. They continued to live there 1876, but moved thereafter. By 1877, 101 Beacon was the home of Charles John Whitmore and his wife, Sarah Olcott Murdoch (Blake) Whitmore. They previously had lived at 14 Beacon. Charles Whitmore was a wholesale grocery merchant and treasurer of the Ames Plow Company. 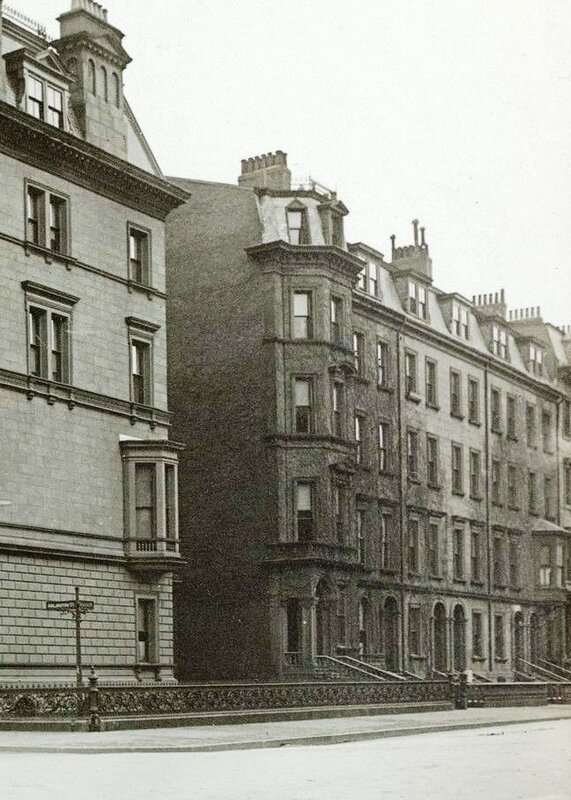 In 1878, they moved to a new home they had built at 322 Beacon. In 1879, 101 Beacon was listed as the residence of “Mr. Weld” in the Blue Book. On December 3, 1879, Elizabeth Mountford transferred 101 Beacon to her nephews, Benjamin W. Crowninshield and George H. Mifflin, as trustees for her benefit. Benjamin Williams Crowninshield was the son of her brother, Francis Crowninshield and Sarah Gooll (Putnam) Crowninshield, and George Harrison Mifflin was the son of her brother-in-law and sister, Charles Mifflin and Mary (Crowninshield) Mifflin. During the 1879-1880 winter season, 101 Beacon was the home of Mrs. John Leland. On December 3, 1880, 101 Beacon was purchased from Elizabeth Mountford’s trustees by Percival Lowell Everett, a merchant in the China trade and founder and president of the Third National Bank of Boston. He was a widower and lived there with his three young children: Louisa Otis Everett, Otis Everett, and Elizabeth Lowell Everett. They previously had lived next door at 103 Beacon. In November of 1882, he married again, to Elizabeth Rothe Fisher. 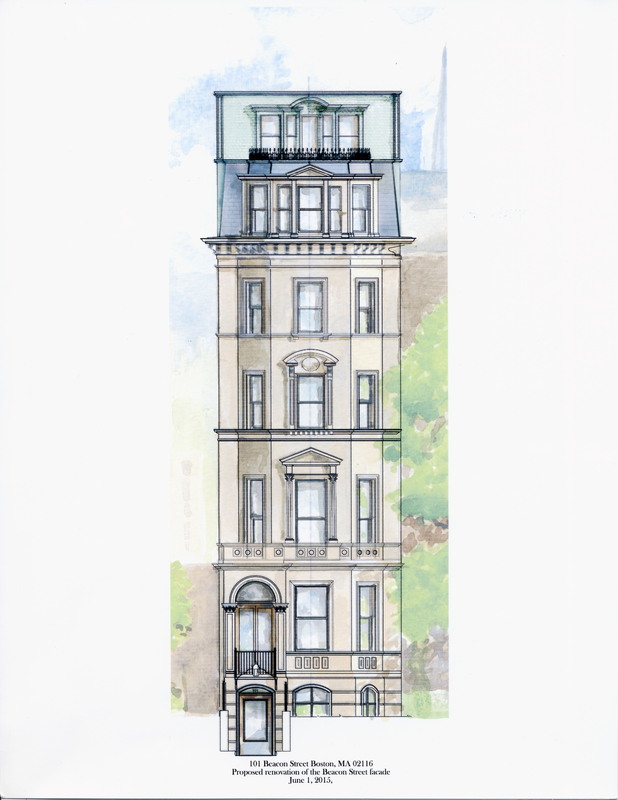 They continued to live at 101 Beacon in 1889, but had moved to 76 Huntington by 1890. On August 13, 1889, 101 Beacon was purchased from Percival Everett by Mary Edmondson (Edgar) Thorndike, the wife of attorney Charles Thorndike. They previously had lived in the Longwood district of Brookline, where they continued to maintain a home. Their son, Dr. Augustus Thorndike, a physician, lived with them. Augustus Thorndike married in October of 1892 to Alice Amory. That same month, Mary Thorndike transferred 101 Beacon to him. 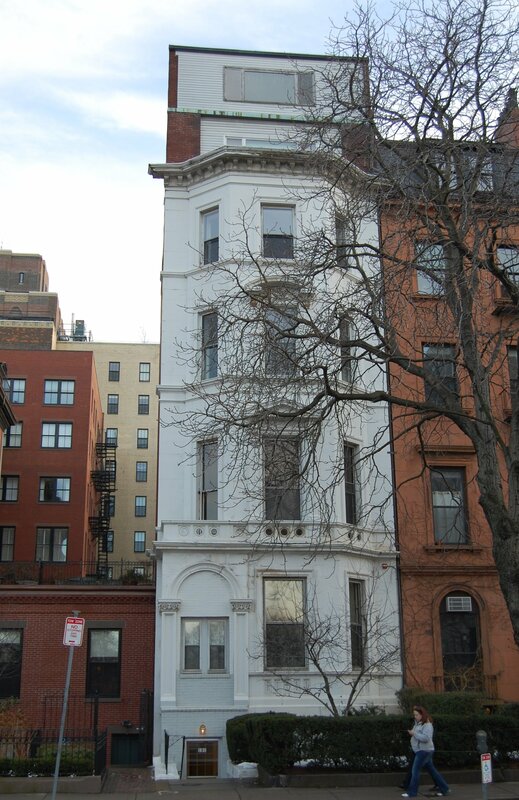 Augustus and Alice Thorndike made 101 Beacon their home, and Charles and Mary Thorndike moved to 111 Beacon. 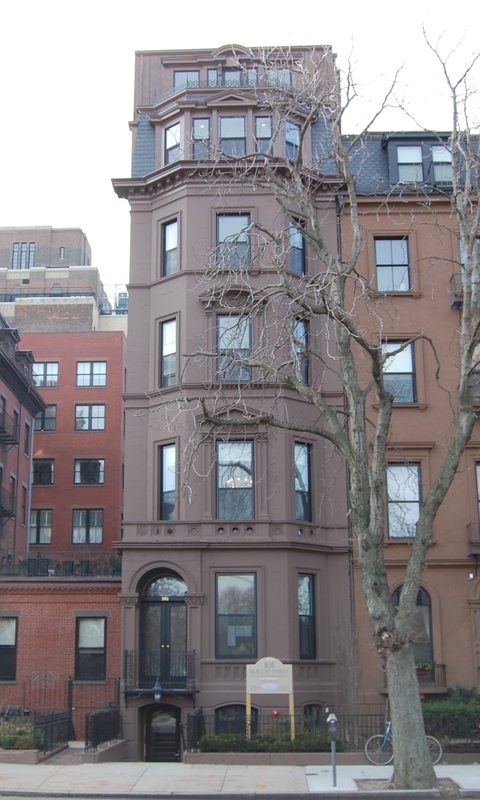 Augustus and Alice Thorndike continued to live at 101 Beacon during the 1897-1898 winter season, but moved soon thereafter to 481 Commonwealth. On April 27. 1898, 101 Beacon was purchased from Augustus Thorndike by Mrs. Anna N. (Hitchcock) Tyler, the widow of Lorin Francis Tyler, a merchant tailor. She previously had lived at 102 Mt. Vernon. Anna Tyler married again, in July of 1901 to Charles Daniel Reynolds, a retired manufacturer from Providence. She continued to live at 101 Beacon during the 1903-1904 winter season (listed as Mrs. L. F. Tyler in the Blue Books), but moved thereafter. She continued to own 101 Beacon. Charles Reynolds died in March of 1906 in Providence. By the time of the 1910 US Census, Anna (Hitchcock) Tyler Reynolds was living in Portland with her niece, Grace (Waldron) Calvert and her husband, Thomas E. Calvert (Grace Calvert was the daughter of William Hale Waldron and Jane Annette Hitchcock). 101 Beacon was not listed in the 1905 Blue Book. By the 1905-1906 winter season, it was the home and medical offices of Dr. Howard Augustus Lothrop. He was a physician and surgeon, and later became a professor of surgery at Harvard Medical School and surgeon-in-chief at Boston City Hospital. He previously had been a lodger (and maintained his medical offices) at 10 Marlborough. Living with Howard Lothrop were his mother, Sarah Gorham (Swain) Lothrop, the widow of Horace Augustus Lothrop, and his brother, Dr. Oliver Ames Lothrop, an ear, nose, and throat specialist. Oliver Lothrop continued to live at 101 Beacon until his marriage in November of 1915 to Edna Montrose Sturk. After their marriage, they moved to Waban, but he continued to maintain his medical offices at 101 Beacon. Howard Lothrop had leased 101 Beacon from Anna (Hitchcock) Tyler Reynolds and then from her estate. In January of 1921, he acquired the house from Anna Reynolds’s heirs: her niece, Grace (Waldron) Calvert, the daughter Jane (Hitchcock) Waldron and William Hale Waldron, and the descendants of her deceased niece, Florence (Glover) Lund, the wife of Oliver Whitney Lund and daughter of Violette (Hitchcock) Glover and Lloyd Glover. Howard Lothrop remained unmarried and continued to live and maintain his medical office at 101 Beacon until his death in June of 1928. His mother continued to live with him. In November and December of 1929, Oliver Ames Lothrop acquired 101 Beacon from his siblings: Caroline Elizabeth (Lothrop) Crosby, the widow of Benjamin Lincoln Crosby; John Howland Lothrop; Susan (Lothrop) Apollonio, the wife of Raymond Pingree Apollonio; and the children of Mary (Lothrop) Apollonio, Raymond Pingree Apollonio’s first wife (and sister of his second wife). Sarah (Swain) Lothrop lived at 101 Beacon until her death in December of 1930. 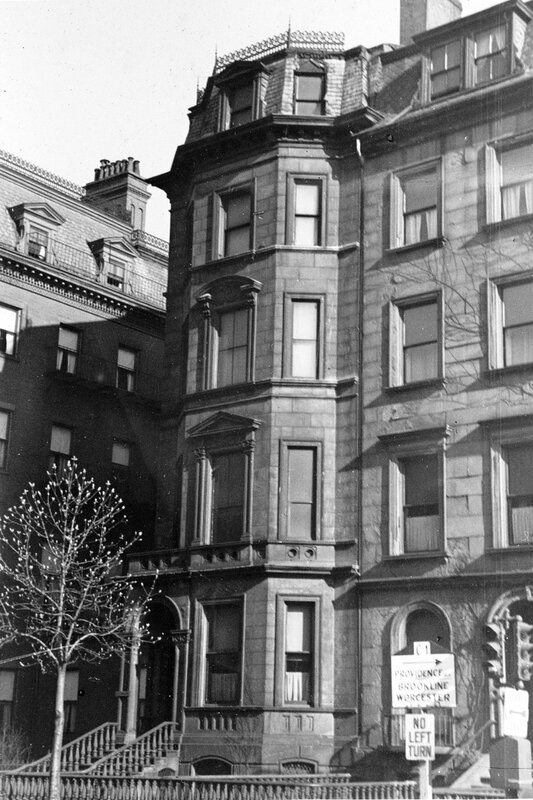 After her death, Oliver Lothrop continued to maintain his medical office at 101 Beacon. The house appears to have been used exclusively for offices. He and his wife, Edna, continued to live in Waban. On December 21, 1954, Oliver Lothrop sold 101 Beacon to the Massachusetts Land Corporation, and on December 17, 1956, it sold the property to attorney Harry Moskow. Oliver Lothrop continued to maintain his office there until about 1957. On December 29, 1958, 101 Beacon was purchased by Benjamin George Brooker, a certified public accountant and real estate dealer. He and his wife, Hannah (Botzin) Myers Brooker lived at 133 Marlborough. In January of 1959, Benjamin Brooker applied for (and subsequently received) permission to remodel the house into eight apartments. In February of 1959, he amended the application to increase the number of units to nine, adding a story to the building by squaring out the existing mansard roof and raising it about three feet. The front entrance was lowered to street level as part of this remodeling. Plans for the remodeling, designed by architect Saul E. Moffie are included in the City of Boston Blueprints Collection in the Boston Public Library’s Arts Department (reference BIN R-205 and R-206). After the remodeling was completed, the Brookers moved to one of the apartments at 101 Beacon. Benjamin Brooker died in March of 1966. Hannah Brooker continued to live at 101 Beacon in the early 1980s and probably until her death in September of 1988. After Hannah Brooker’s death, 101 Beacon became the property of Lorraine (Myers) Fish, Hannah Brooker’s daughter by her marriage to Harold Myers. On June 30, 1990, Lorraine Fish transferred the property to herself and her husband, Abraham L. Fish, as trustees of The Fish Realty Trust. In May of 2014, 101 Beacon was purchased from Abraham and Lorraine Fish by Andrew Constantine of the One-O-One Beacon LLC. In 2015, he applied for (and subsequently received) permission to remodel the property into nine units, renovating the front exterior in a manner sympathetic to the original design of the house, including reconstructing the entrance and upper stories and repainting the exterior to be the color of brownstone. The remodeling was designed by Michael Scanlon, working in association with Choo & Co., Inc., architects.